"Nicholas Isherwood has been a great teacher, mentor, and friend since I first worked with him at the California Institute of the Arts in 2007. Nicholas is an immensely talented singer, conductor, actor, and director who leads all of his projects with a commanding authority, infectious humor, and unbelievable depth of artistry. We have collaborated on many period instrument projects from Banchieri to Purcell, all of which he infused with his immense historical knowledge, perfectly blended with an emotional intelligence that brings music centuries removed from our time with at least as much vitality as any music of today. Nicholas is a leader who knows how to effectively delegate authority by bringing students such as myself into the creative process in a meaningful way. This not only put a good deal of creative responsibility on student leaders such as myself by directing many rehearsals and sectionals, but also gave me essential professional experience that helped me as I transitioned into my full-time teaching position at the Interlochen Center for the Arts. 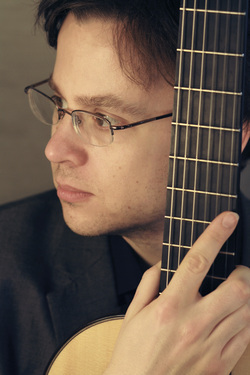 Nicholas continues to support my professional growth by connecting me with presenters in the USA and Europe, and working on developing our own chamber music projects that I one day sincerely hope to present with him." "Nicholas Isherwood is one of the most intriguing and astounding performers as well as voice teachers in the U.S. and Europe right now. I had a tremendously valuable opportunity to study with him at CalArts in 2008 and through out the years following that, I continued to seek his advise for a variety of music and performance related projects. He is a widely-respected voice teacher, famous for many contemporary/baroque performances and recordings with the most important composers of the 20th and 21st Centuries, and his knowledge of the international music scene is absolutely profound. During my studies with him, I landed my first gig with the LA Philharmonic Orchestra, and he guided me well through the difficult solo passages of Schnittke's symphony. In addition, I was introduced to the legendary Silvano Bussotti, who immediately heard my audition after learning that I was studying with Nicholas Isherwood, which followed by an offer to sing with the prestigious Santa Cecilia Academy. Even now, whether working upon his recommendation at Berlin Konzerhaus, or with the Bang on a Can All-Stars, I return to the exercises that he instilled into my vocal practice. As a student, I was not only treated with professional respect and trust by Mr. Isherwood, I was also taken seriously, encouraged to seek out new singing opportunities, and was always supported and safely nurtured in my pursuit as a creative human being. And as I am continue to grow as an emerging singer on the contemporary and cross-cultural stage, I can only hope one day to sing in as many world-premieres as Mr. Isherwood!" "I would like to comment on the professor, genius and all around outstanding gentle man that is Nicholas Isherwood. As a student of Nicholas, I witnessed his original technique, his ease in teaching, and his admirable patience in private lessons and in the classroom setting. What I admire most in Nicholas is the way he conducts his private lessons and classes with honesty and simplicity in teaching students of various vocal levels and backgrounds. It is hard to find a teacher who is capable of discovering a students strengths and weaknesses and addressing them within the very first lesson in an encouraging and supportive manor. Nicholas is one of those rare teachers who has the natural gift to do that for his students. Nicholas is a personable man, which makes it easy for students to express themselves freely and openly at any given moment. In my first lesson with Nicholas I was able to express my needs in terms of improving my voice and together we set very specific goals for the semester. By the end of the semester, my voice had transformed drastically. I was impressed with the tremendous amount of improvement in myself from studying with Nicholas. 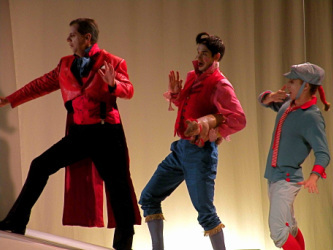 Beyond private lessons, I was fortunate enou to take part in 'La Pazzia le Senile', a Commedia del Arte workshop and performance class. On his own, Nicholas was capable of maintaining a level head in collaborating and dealing with the vast differences between the singers, musicians and actors. Both the students and Nicholas grew from the rare opportunity of working with artists/performers of different disciplines and the students loved taking in the knowledge and experience that Nicholas had to offer. I highly recommend Nicholas as a teacher because not only is he qualified from his credentials and expertise, but also because I have witnessed others and myself gain more confidence in both voice and personality." "I am a Japanese baritone singer and have sang in many modern vocal music concerts. Some concerts I sang in had big meaning for the Japanese musical scene. For example, I sang the very difficult part of Iannis Xenaxis's Oresteia in the Japanese premiere. I also sang works for vocal ensemble by Sylvano Bussoti and Helmut Lachenmann (which are both difficult because of complicated notation), in the composers' presence. I have worked with some leading composers in Japan like Joji Yuasa and Yori-Aki Matsudaira, and have taken part in some projects by Japan Society for Contemporary Music. 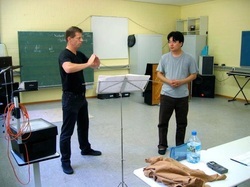 Though I usually sing in Japan, I sang in a concert at Japanisches Kulturinstitut Cologne with a German interpreter last year. I sang the works of Shoko Shida, John Cage and Giacinto Scelsi. This concert was broadcasted by Deutschlandfunk. Thanks to Mr. Nicholas Isherwood's excellent teaching, I get allot of opportunities like these. To learn the interpretation of Stockhausen's music, I have enrolled each summer (since 2000) in the "Stockhausen Courses" which are held in Kurten, Germany. Mr. Isherwood gave me a series of intensive lessons while at the courses. He had worked with Karlheinz Stockhausen for some 20 years and knows everything about the interpretation of Stockhausen's vocal music. Though Stockhausen's demands on performers is so strict that it often seems unplayable, Mr. Isherwood teaches with patience, how to practice this difficult music. He never gives up teaching even if it seems almost impossible for students to solve problems, and he keeps encouraging them. Mr. Isherwood is has allot of ideas about the music and solving problems and I am very inspired by them. As soon as I show him an idea, he suggests to also try other ideas, and I try them again and show him another idea, and he suggests further ideas...... and so on. It is an interesting process to learn and create music. I sang in a student concert for the courses 3 times under Stockhausen's supervision. 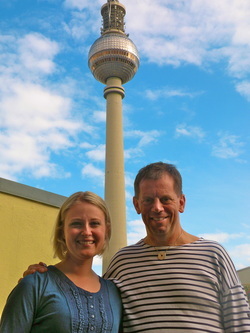 I won a Stockhausen prize in 2007 for my performance in SPIRAL for soloist and shortwave radio. 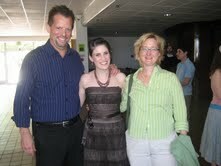 Of course Mr. Isherwood gave me allot of suggestions as a vocal teacher. With his wide knowledge of vocal technique and his skill with various languages, he teaches how to sing with a beautiful voice, how to make contrasts of expression and how to pronounce the text clearly. His explanations were so logical and easy to understand that I was able to grow in my singing skills very quickly. Mr. Isherwood also teaches how to play music with spiritual joy, which is the most important thing for a musician. His teaching and singing are always full of energy and emotion, which also influenced my performance of other composer's music and kept me being creative! I am very happy to learn with him and strongly recommend Mr. Isherwood as a teacher." "Nicholas has great intuition and can figure out exactly what (and how) to teach his students to help them improve vocally. Nicholas played a very important role in my finishing my Master’s degree. We worked together for a short time, but in that time, we made tremendous progress. I was preparing for a very difficult contemporary solo recital as well as the title role of Dido and Aeneas. We worked on perfecting technique: basic and advanced from breath support, pure vowels, trills, legato, and ornamentations. We focused on cultivating the art of early music (Purcell) as well as the advanced nuances in of the 20th century music (Crumb). Nicholas is the kind of voice teacher that doesn’t let anything by. He is ALWAYS listening, noticing, analyzing, and communicating. I am very grateful that I had the chance to work with him." "One unique aspect of Nicholas’s teaching is his ability to inspire his students to take risks in their performances—and in their lives beyond the stage. The risks that I’ve taken as a singer thanks to Nicholas’ advice and support have helped me to seize other opportunities in my life outside of singing." " I will always be very grateful to Mr. Isherwood. From all of the voice teachers that I had over the years, he has played a decisive role in the kind of professional performer and educator I became. His precise understanding of the vocal apparatus and techniques makes him extremely clear at the moment of explaining that to his students and make them to experience and pay attention to the various nuances of voice production. This talent is not only invaluable for the beginning student who needs a solid technique but for the advanced one too, who may need to perfect his/her technique and maybe later apply these procedures in their own teaching. Actually that was my case. Isherwood solidified my vocal technique and my understanding of it. I still use in my studio some of his wonderful vocal and breathing exercises. His insightful interpretive coaching of the vocal literature opened my eyes to all sorts of music, and since his expertise in early and contemporary music coincide with my own interests, I really nurtered from his comments in this area. He guided me through very complex contemporary pieces such as Stockhausen's "Am Himmel Wander Ich" and Crumb's "Madrigals", and showed me how to exploit the diversity of vocal sounds that we can produce as singers, from the most pure sound to all sorts of extended techniques. Through him I also learned more about musical genres rarely performed such as "madrigal comedy". Some years after performing under his stage direction, Banchieri's "La Pazzia Senile", I stage directed my own production of Banchieri's "La Barca de Venezia per Padova" in the Music Theater Workshop that I taught at Hartwick College (where I was a Residence Artist and Vocal Coordinator from 2002 - 2007). Finally, Isherwood's invaluable career guidance made me the performer that I am today. Very concrete facts such as when he took me with him to Germany to coach with Karlheinz Stockhausen and that lead to innumerable invitations around the Americas to perform this work, from Canada to Argentina, kicking off my professional career. That opened all sorts of possibilities and contacts to perform and record works of new composers: Music at the Forefront (Bowling Green, OH); New Music New Haven (Yale University); Music Gallery at Toronto (Canada); Museo Fernández Blanco (Argentina); Musica Aperta Ensemble (Washington DC); UNCG Contemporary Music Festival (Greensboro, NC); "Where Does Love Go?" Innova Records; " America's Millennium Tribute to Adolphe Sax, vol.VIII" University of Arizona Recordings. Through his own performances and coaching, I learned about presence onstage, and musical and professional integrity. Every time I walk onstage I remember his teachings." "Studying with Nicholas was my first real introduction to contemporary music and the avant-garde. Ever imaginative and enthusiastic, he found a way to bring challenging work within our grasp and making it engaging and fun. Now, with my students, I try to capture that same sense of adventure. In a country with a much shorter history of the western classical music tradition, there are many avenues yet unexplored in the conservatories. I attempt to afford my students the opportunity to expand their vision of the vocal world. As a performer, I find myself much more open to experimentation with vocal color and interpretation in general. I am continually striving to push my own limits. For this way of looking at the voice, and it's repertoire, I owe much thanks to my formative experience with Nicholas and his wide breadth of knowledge from dramatic madrigal to the newest, edgiest, in-your-face, redefining-your-understanding-of-music pieces." 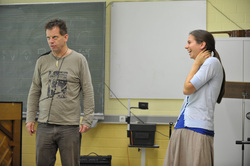 I am professor of singing at the Conservatory of Music, Dance and Theater of Troyes. I wanted to discover contemporary repertory and signed up for Nicholas Isherwood’s master class at the ARIAM Ile de France in 2004. I immediately admired his high level of technical competence and abilities as an interpretor, as well as his musical culture, especially with regard to advice on repertory for students of all levels, from young students to professionals. Nicholas Isherwood helped me to better understand my entire vocal instrument, especially the use of resonators, as well as make me more open to contemporary scores, both physically and mentally. The work on vocal technique also helped me to enrich the harmonics in my timbre. This is, of course, also important for standard repertory. Based on the determination and motivation afforded in the master class, I passed on what I had learned to my voice students and, in order to be even more persuasive, I organized a series of events at my conservatory in 2005 entitled “The Voice Revealed: 1900 to the Present.” Nicholas Isherwood was the principal invited guest and proved his qualities as a pedagogue on numerous occasions, including workshops with elementary school and high school students in which he perfectly adapted to the age of his audience by varying the subject matter and presenting exercises leading to conclusive development. He gave a master class for my voice students at the conservatory (all women that year) in which he revealed an astonishing chest register for one (a mezzo soprano), a better technique for managing registers for another and a better means of putting the voice at the service of interpretation for all. He also led a debate on “How to teach contemporary singing” and ended his stay in Troyes with a breathtaking recital on the theme of Capricorn that amazed his audience and the local press. I have complete confidence in Nicholas Isherwood as a person and a teacher on all levels. He has enabled me to make progress with my vocal technique and to discover new repertoire. My voice students continue to benefit from his teaching.